MONGOLIAN KHAN (AUS) (Bay 2011-Stud 2016). Horse of the Year & Champion Stayer in NZ in 2014-15 & 2015-16. Champion 3YO in NZ in 2014-15. 8 wins from 1400m to 2400m, NZ$625,500, A$3,363,250, New Zealand Derby, Gr.1, Australian Derby, Gr.1, MRC Caulfield Cup, Gr.1, Avondale Guineas, Gr.2, Waikato Guineas, Gr.2. Half-brother to SW Young Centaur (Wellington Cup, Gr.1). His oldest progeny are yearlings. COLLEGE GIRL, by All American. Winner at 2100m in Aust. Sister to YANKEE ROSE. This is her first foal. YANKEE ROSE (All American). Champion 2YO Filly & 3YO Filly in Australia in 2015-16 & 2016-17. 4 wins-3 at 2-from 1100m to 2000m, A$2,043,700, ATC Sires' Produce S, Gr.1, Spring Champion S., Gr.1, Jimmy Cassidy Golden Gift 2YO P., Viridian Lightbridge 2YO P., 2d ATC Golden Slipper S., Gr.1, 3d MVRC WS Cox P., Gr.1. Great Dansaar. 3 wins-1 at 2-at 1000m, 1200m, 3d ATC Flinders Lane Perfect Fit Shirt 2YO H.
Aldesaar. 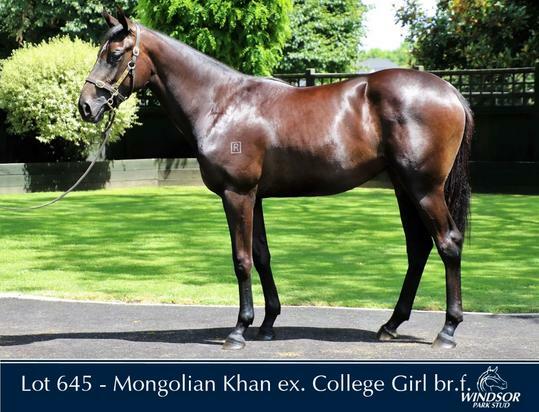 2 wins at 1350m, 1500m, 3d ATC McGrath Estate Agents H.
College Girl. Winner. See above. REDOUTE'S DANCER (Redoute's Choice). Top of the 2006-07 NZ 3YO Free H. (1650m+). 4 wins from 1800m to 2400m, NZ$480,000, A$87,450, New Zealand Derby, Gr.1, ARC Championship S., Gr.2, AJC Mosman H., 2d AJC Pepsi Max H., AH Beard Toparoa H. Sire. Cosmo Nadal. 8 wins from 1400m to 1800m, 2d Kokura Chukyo Sponichi Sho, Hayatomo Tokubetsu. Caldane. 5 wins-1 at 2-to 1400m, A$77,000, 2d ATC Drummond Golf H.
BIKO PEGASUS (Danzig). 4 wins-2 at 2-at 1400m, 1600m, US$1,288,031, 2,123,348¥, Chukyo Centaur S., L, Nakayama Keisei Hai, L, 2d Chukyo Chunichi Sports Sho Yonsai S., L, Takamatsunomiya Hai, L, Kyoto Swan S., L, Silk Road S., L, Nakayama Sprinters S., L-twice, 3d Nakayama Lord Derby Challenge Trophy, L, Tokyo New Zealand Trophy Yonsai S., L, 4th Tokyo February S., L. Sire. Roxy Flyer (Rock of Gibraltar). 3 wins at 11f, Goodwood Meccabingo.com H., Kempton D&G Consultancy Services H., 2d Kempton Wild Flower S., L, Lingfield River Eden S., L, 4th Goodwood Daisy Warwick S., L, Tapster S., L, Newmarket Princess Royal S., L, Windsor August S., L.
Lydney. 2 wins at 1500m, 2000m, VRC Spitfire H., 2d VATC Nationwide Credit H. Producer. Valiramix (Linamix). 6 wins from 2000m to 3400m, Newbury Bula Hurdle, 2d Longchamp Prix de Courcelles, L, 3d Sandown Coral Eurobet Championship Hurdle. SYMBOLI GRAN (Grand Lodge). 5 wins from 1200m to 1600m, 341,543,000¥, Kyoto Aoi S., L, Tokyo Oro Cup, L, Chukyo CBC Sho, L, 2d Hanshin Centaur S., Gr.2, Niigata Sekiya Kinen, Gr.3, 3d Kyoto Mile Championship, Gr.1, Nakayama Yukan Fuji Sho Ocean S., Gr.3, Kyoto Silk Road S., Gr.3. TOUT SEUL (Ali-Royal). Second on The 2002 European 2YO Classification. 6 wins-5 at 2-at 6f, 7f, £260,612, €184,202, 2,400,000¥, Newmarket Dewhurst S., Gr.1, Leicestershire S., L, Curragh Tattersalls Breeders 2YO S., Ascot British Red Cross Shergar Cup 2YO S., 2d Redcar Betabet 2YO Trophy S., 3d Irish Two Thousand Guineas, Gr.1, 4th The Two Thousand Guineas, Gr.1, Newmarket Joel S., Gr.3, Ben Marshall S., L. Sire. Tee's Prospect (Lil E. Tee). 9 wins to 6f, 2d Hoosier Park Brickyard S., L.